SOUTH ASIA (ANS) — As human beings, we need about 13 to 26 gallons of water each day (1). Research from the United Nations shows that people who live 1 kilometer (0.6 miles) from a water source often use less than 1.3 gallons a day—and 800 million people worldwide find themselves in that situation (2). Monsoon season brings an interesting paradox to many areas of South Asia. With months of constant rain, water seems to be everywhere, yet there is an acute lack of safe water, according to Gospel For Asia (GFA). Four villages in one region of South Asia were no different. These communities faced a severe water shortage during the summer, but in the rainy monsoon season, their water sources were contaminated by chemicals. Those who could afford it would buy their water, but others had to walk for several kilometers each day to ask for water at the homes of nearby landlords. If the homeowners would choose to share their water, the villagers would carry two pots of water the long distance back to their homes. GFA-supported churches in the region were concerned about the people and their need for clean water, and in 2014 GFA was able to drill four ‘Jesus Wells’ to provide safe, pure water for these villages. By God’s grace, there are now approximately 5,300 people who benefit from these wells! 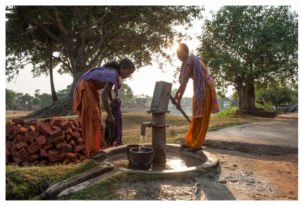 Just as these four ‘Jesus Wells’will provide communities with safe water for drinking, cooking and bathing for decades to come, the wells also stand as a constant witness of Jesus, the Living Water. (1) World Health Organization (WHO).